Belt Buckle w/Optional Gold, "Lion"
Neil has been anxious to make this trophy-style belt buckle for some time. It's one of several that he will do eventually, just for the fun of it. He really likes the composition with the lion as the focal point of the vast savanna. 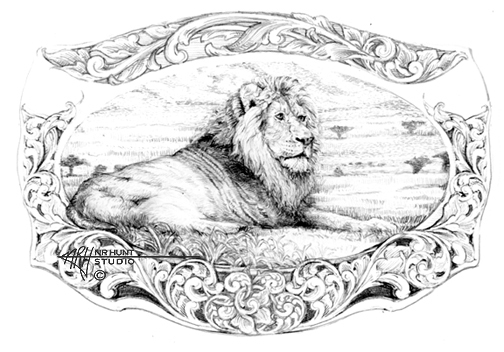 This drawing shows the buckle done in all sterling silver, however, Neil would like to do the lion in gold overlay and perhaps add some gold line-inlay in the scroll-work. Another option would be to do both the lion and the savanna in gold. The lion and the background could be done in bolino engraving or sculpted in bas relief. Pricing for Hand Engraved Trophy-Style Belt Buckle, "Lion"